The University of North Georgia (UNG) received its ninth consecutive LeeAnn Noble Make-A-Wish Award for most funds raised. 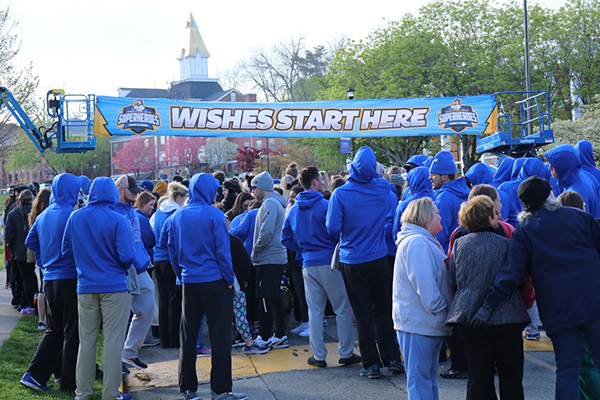 UNG's annual Make-A-Wish Walk for Heroes raises more than $20,000 a year. The University of North Georgia (UNG) received its ninth consecutive LeeAnn Noble Make-A-Wish Award for most funds raised. The Peach Belt Conference (PBC) award was presented at the May awards dinner in Hilton Head, South Carolina. UNG has finished in the top five in NCAA Division II in Make-A-Wish giving for seven years in a row and led the country on five occasions. In 2017-18, UNG raised $31,875 for Make-A-Wish, nearly $6,000 more than the previous year. The Make-A-Wish Foundation grants wishes to children with critical illnesses. "This is about giving back to a wonderful foundation and to our community," said Lindsay Reeves, director of athletics at UNG. 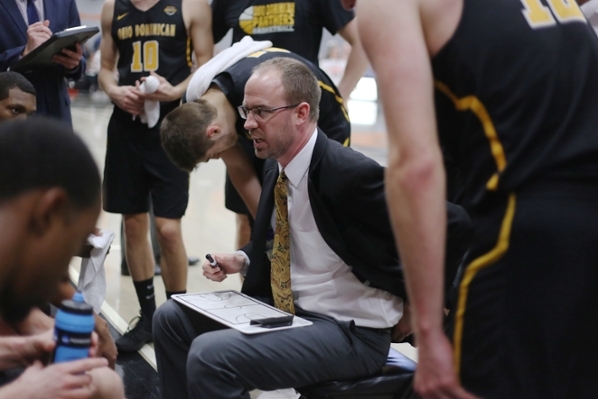 "The student athletes are committed to giving back and especially to children who are not as lucky as they are and are battling life-threatening illnesses." UNG student athletes are responsible for initiating the fundraising methods. UNG's annual Make-A-Wish Walk for Heroes raises more than $20,000 a year, Reeves said. "Student athletes also raise money each year at Dahlonega's Gold Rush Festival and other smaller initiatives held at athletic events," she said. Since 2010, UNG has raised more than $133,000 for Make-A-Wish, helping grant more than 13 wishes in eight years. After raising at least $10,000 each academic year since 2010-11, the Nighthawk Nation earned the honor of hosting six Make-A-Wish reveals. The top eight schools in fundraising are granted a reveal, Reeves said. In April, UNG held a Make-A-Wish reveal party for Chandler Holcomb, the 2018 Make-A-Wish recipient from Gainesville, Georgia. Holcomb, a 9-year-old battling leukemia, was granted his wish of going on a Disney Cruise to the Caribbean with his family. 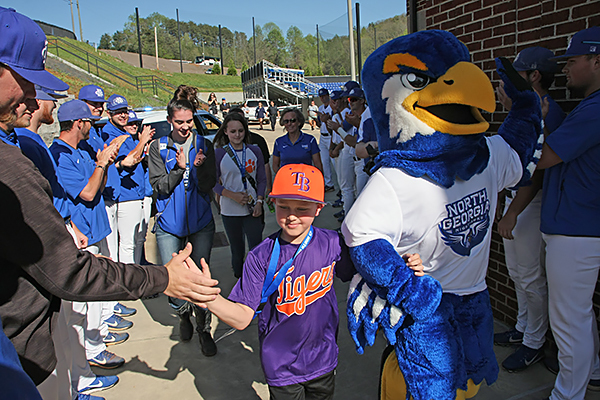 Chandler Holcomb, a 9-year-old from Gainesville battling leukemia, is escorted by UNG's Nigel the Nighthawk past student-athletes at the Coleman Field House as part of his Make-A-Wish celebration at Bob Stein Stadium on April 17. Reeves said these reveals are special for the student athletes. 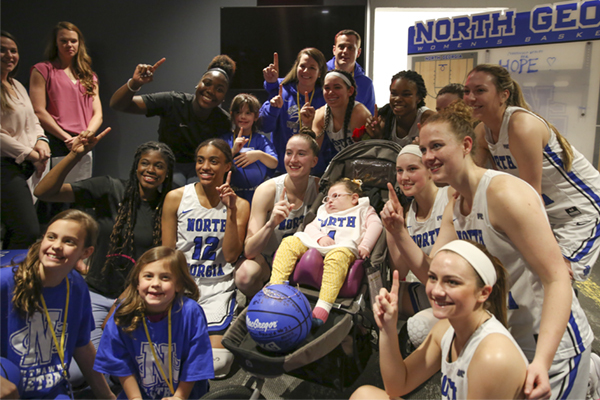 "This effort hits very close to home for the UNG athletics community as we have had two Make-A-Wish children as student athletes in the past 10 years," she said. The Division II Student-Athlete Advisory Committee, which is the primary student-based group that contributes to making policy for the division, established the Make-A-Wish partnership in 2003. It has become one of the foundation's largest and most consistent contributors. Each year, all Division II schools participate in raising money for Make-A-Wish. Division II has raised more than $5.3 million toward granting the wishes of more than 660 children with life-threatening medical conditions. These wishes can serve as a game changer in children's fights against their illnesses, helping them feel better, and in some cases even get better. The PBC Make-A-Wish awards were renamed the LeeAnn Noble Make-A-Wish Award following the 2013-14 season. Noble was a women's golfer at UNG and former wish recipient from Make-A-Wish. She appeared on the cover of NCAA Champion Magazine in fall 2013 and died in March 2014. Her dedication to the Make-A-Wish program will live on with these awards forever bearing her name.